Higher genomic levels of African ancestry are associated with an increased risk for Alzheimer’s disease, a consortium of investigators reported recently in Alzheimer’s & Dementia. It was known that African-Americans are at a higher risk for Alzheimer’s disease, said the study’s first author, Timothy Hohman, Ph.D., assistant professor of Neurology. 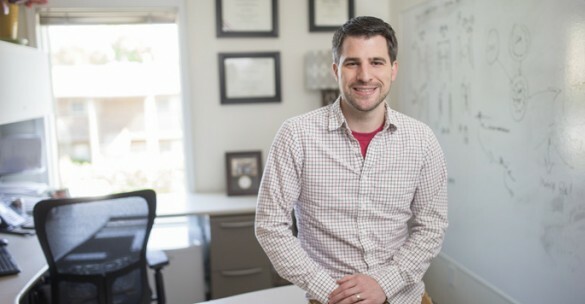 Hohman and his colleagues in the Alzheimer’s Disease Genetics Consortium, including Tricia Thornton-Wells, Ph.D., adjoint assistant professor of Molecular Physiology & Biophysics, wondered if genomic ancestral differences contribute to this health disparity. The researchers performed a comprehensive analysis of data sets contributed to the consortium, focusing on African-American individuals with or without late-onset Alzheimer’s disease. They found that compared to controls, African-American individuals with Alzheimer’s disease had higher levels of African ancestry across the entire genome. “Differences in the percentage of genetic African ancestry among African-American individuals may be relevant to Alzheimer’s disease risk,” Hohman said. When the investigators “zoomed in” on specific genetic locations already linked to Alzheimer’s disease, they found that these areas of the genome had differences in African ancestry between cases and controls. “It appears that, within the data sets we examined, the global difference in ancestry is being driven by effects at loci that are relevant to Alzheimer’s disease,” Hohman said. In additional analyses, the team identified regions across the genome with the greatest differences in African ancestry. These regions contain between 20 and 40 genes, Hohman estimated. Some of the regions are novel; they have not been associated with Alzheimer’s disease in other studies. Hohman said that members of the consortium will follow up with more detailed “fine mapping” analyses of these regions to discover genes that might be linked to Alzheimer’s disease. “There may be some unique biological factors driving Alzheimer’s disease in African-Americans,” Hohman said. Previous studies have demonstrated that the effect of genes that increase risk for Alzheimer’s disease is not always the same in whites and blacks. Hohman noted that socioeconomic factors might be confounding factors in the current study. “It’s possible that there’s a co-occurrence of African ancestry and lower socioeconomic status in some of these cohorts, which then leads to the health disparities,” he said. In a follow-up project, the investigators are compiling socioeconomic data, particularly education data, for individuals in the study. “The hope is that we can tease apart some of the environmental factors and have a more informed, complete picture of the genomic ancestry effect,” Hohman said. This research was supported in part by the Pharmaceutical Research and Manufacturers of America Foundation Fellowship in Translational Medicine and Therapeutics and by the National Institutes of Health.